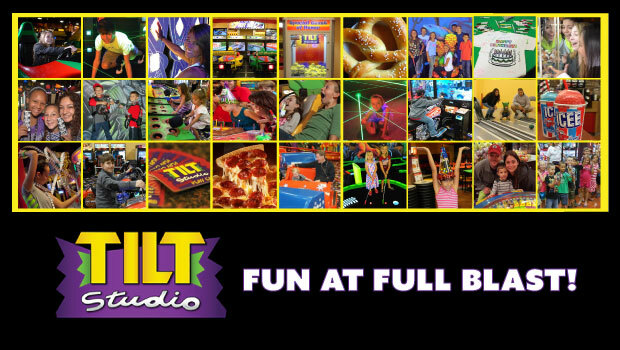 Tilt Studio Family Entertainment Center hosts a variety of games and attractions that appeal to people of all ages. The fun center features a unique combination of food, fun and 'freshments in a safe, clean and welcoming environment. 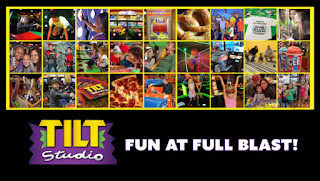 Guests will enjoy FUN AT FULL BLAST at Tilt Studio with a dynamic roster of more than 100 classic and modern interactive video and redemption prize games for all skill levels. Whether you are looking to host a meeting, team building event, group gathering, non-profit FUNdraiser, or awesome birthday party, Tilt Studio can accommodate groups of all sizes. Buy One Attraction, Get One Attraction FREE! - Buy one attraction at regular price, get one attraction FREE! Attractions include: Laser Tag, Black Light Mini Golf, Mini-Bowling, Tilt-A-Whirl Ride, and Outrun SP Deluxe Race Cars. This post is sponsored by U.S Family Guide & Tilt Studio. I will receive free passes for my whole family in exchange for my honest review.